One person died, and another was seriously injured after a crash involving several vehicles in Skye this morning. 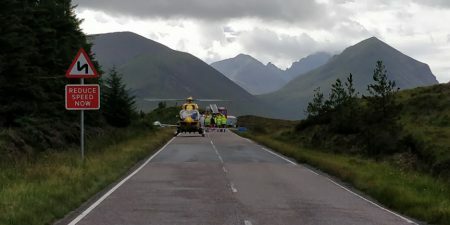 The accident happened at around 8.50am, on the A87 about one mile north of Sligachan. The 54-year-old man was the driver of a white Ford van involved in the collision. His next of kin are aware. Another man from the same vehicle has been airlifted to the Queen Elizabeth Hospital in Glasgow for treatment to serious injuries. The road currently remains closed with a diversion place from Sligachan to Dunvegan on A863 and then on A850 via Edinbane to Portree. Road Policing Sergeant Ewan Calder said: “Our thoughts at this time are very much with the family and friends of the victim of this collision. “I would also extend our thanks to the public for their patience while the road has been closed. Information can be passed by calling the Road Policing Unit in Dingwall on 101, quoting incident 782 of August 8. 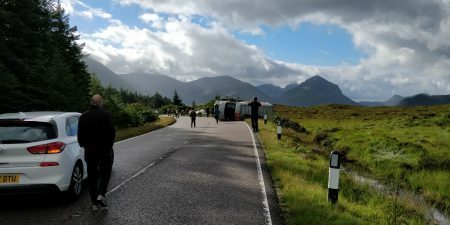 Free Press reporter Adam Gordon was travelling south from Portree and came on the scene moments after the accident happened. He said: “A driver of a car was flashing their lights as they passed me – I think they must have caught sight of the accident in their rear-view mirror. Just after that I came behind a line of traffic that had stopped. “There were people by the roadside giving first aid. “A white van was badly smashed up, with a white car lying across the middle of the road. Another van had also left the road. At least four vehicles were involved in the incident. Today (Wednesday 8th August) is Skye Highland Games Day in Portree – traditionally the island’s busiest day of the year.